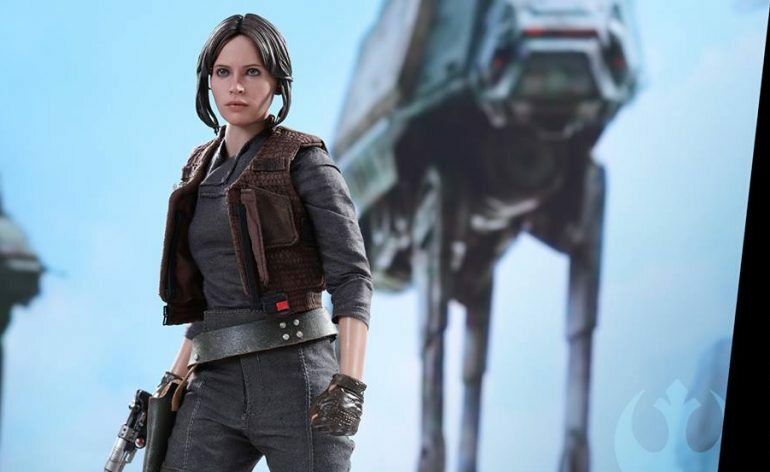 First thoughts: Who Photoshopped Lego hair onto Felicity Jones for the Hot Toys Rogue: One Jyn Erso action figure? I really thought the face sculpt looked amazing! 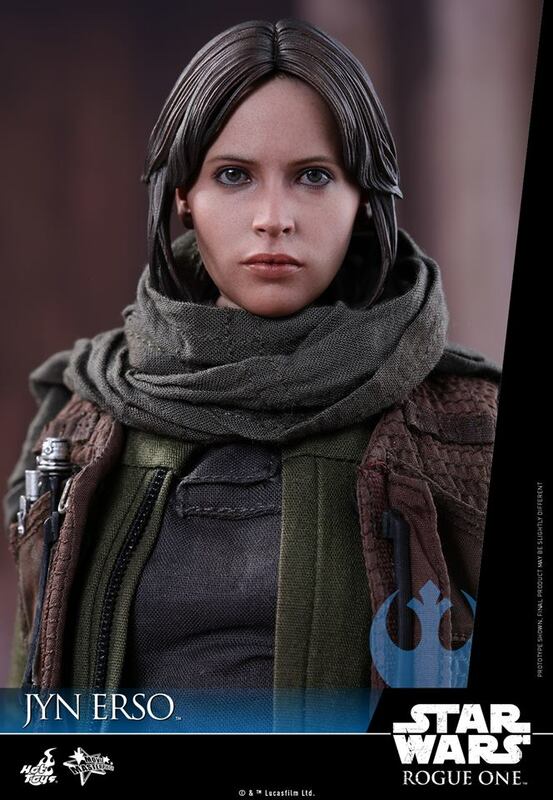 But the hair is so not up to the quality I’ve come to expect from Hot Toys. 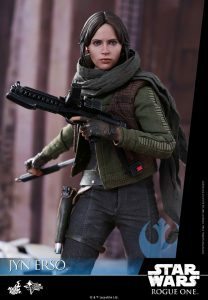 Her clothes are all made out of real fabric and stuff, so I think if not real hair, slightly more realistic plastic hair? Anyway, there are way, way more pros than cons, so let’s get started! 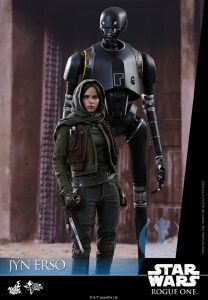 How big is the Jyn Erso action figure going to be? 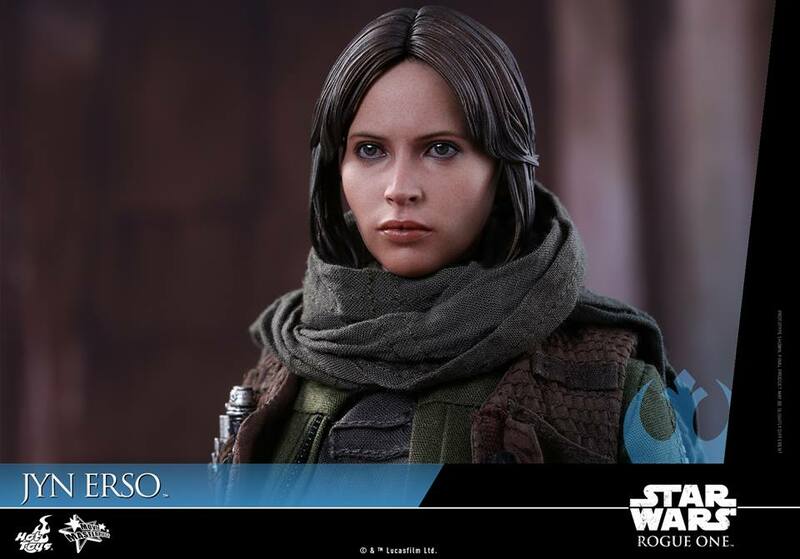 The 1/6 scale Jyn Erso Figure is going to be just under 11” tall (27cm). What type of articulation will it have? According to the Hot Toys website, the Jyn Erso figure will have over 30 points of articulation. 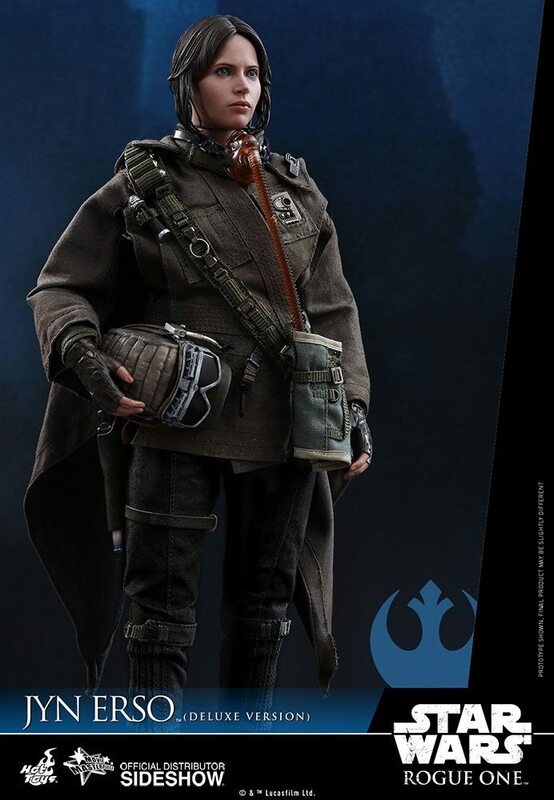 What are some highlights of this figure? Well, the face sculpt and paint is absolutely insane. From the delicate eyebrows to the photo-realistic irises, to the amazing skin texture, a picture of the figure taken in the right light could probably be passed off as a picture of Felicity herself! In fact, the face is so dang good it makes the hair look even worse. 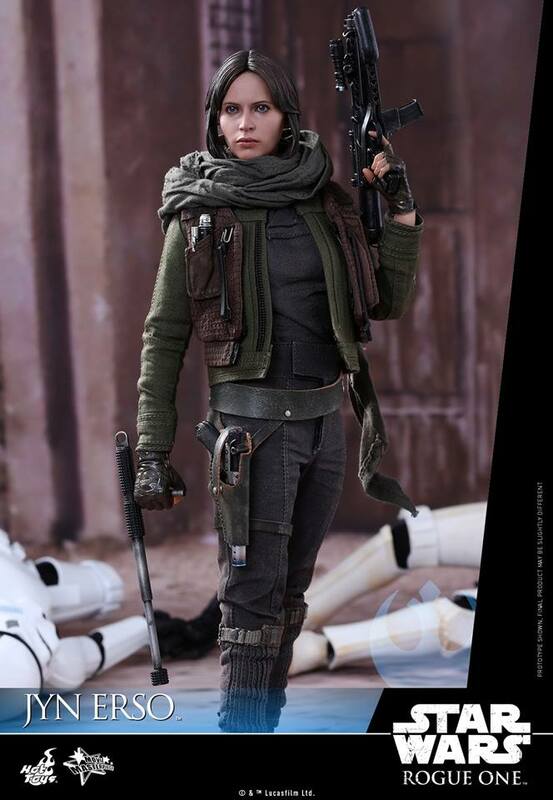 The second coolest part is her multi-layered real fabric costume. Starting from the top, the Jyn Erso figure comes decked out in: a dark green scarf, an olive-green jacket, a brown vest with pockets and small accessories, a gray shirt, fingerless leather-look gloves, a belt holster with leg straps, a pair of gray pants, and a pair of brown boots. 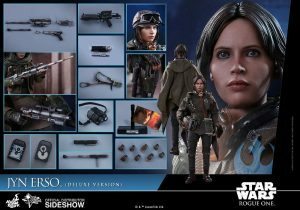 Just as a super cool side note, if you order the Jyn Erso figure exclusively through Sideshow, the figure will come with a poncho, a bandolier with 5 ammo cartridges, and an aviator cap with goggles. 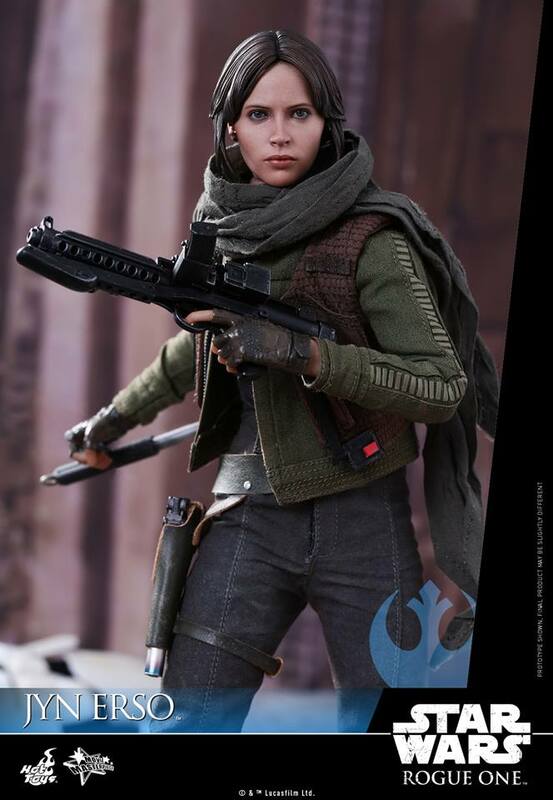 In addition to her massive wardrobe, Jyn will come with a blaster pistol and a blaster rifle, in addition to an articulated collapsible baton and a portable case. To work with her accessories, the figure also comes with 8 individual mix and match hands, including a pair of fists, a pair of blaster-holding hands, a pair of hands for the other accessories, one relaxed left hand and one right hand for the baton. 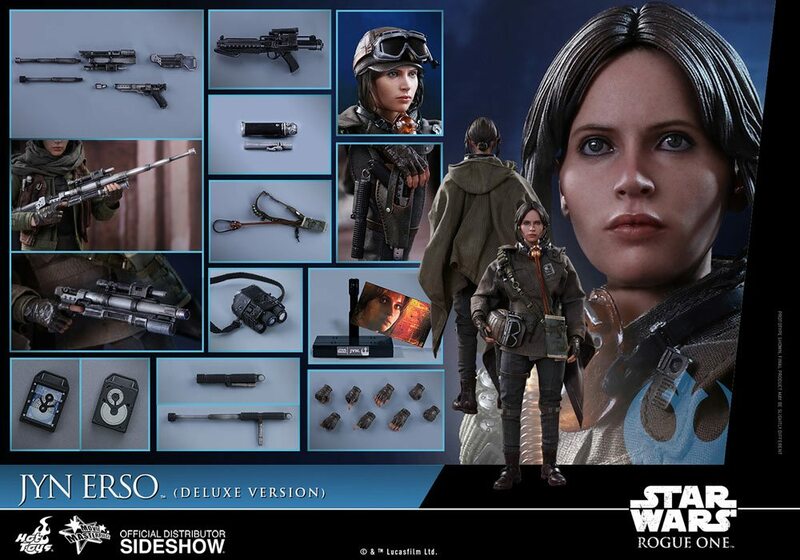 It also comes with a simple black character-specific stand and a cardstock portrait of Jyn Erso from the movie. 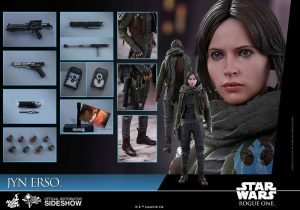 Are there any additional Deluxe accessories? Of course! 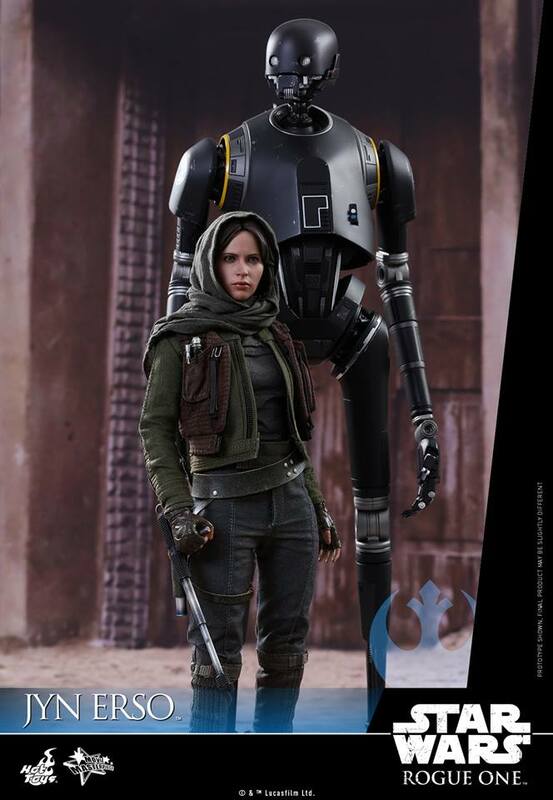 This is Hot Toys, isn’t it? 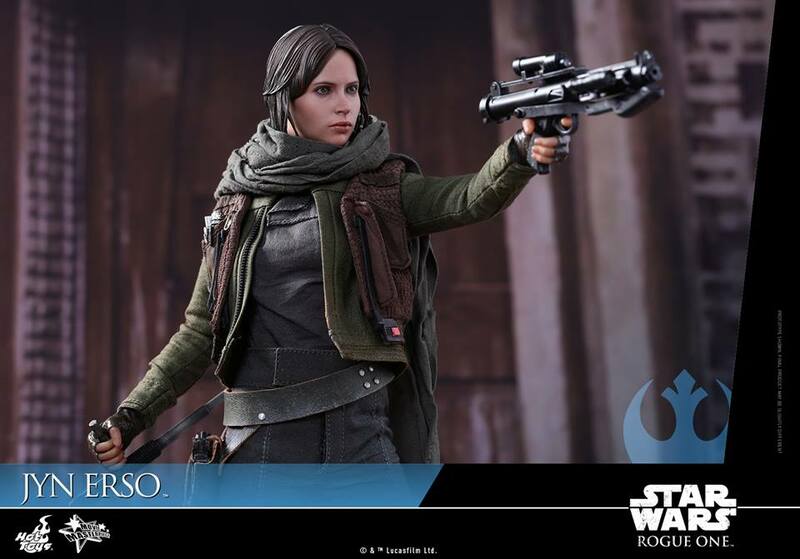 The deluxe Jyn Erso figure will come with some blaster parts so you can mod her basic blaster pistol to make another rifle. It will also come with a pair of “quadnoculars” which I don’t think is a real word, and a breathing mask. 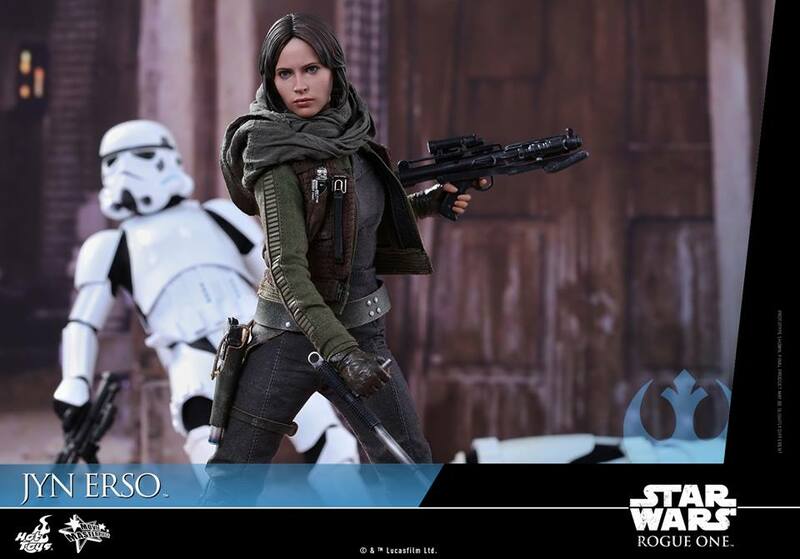 How much will the Rouge One Jyn Erso action figure cost? You can pre-order the deluxe figure from Sideshow Collectibles now for $249.99, or the regular figure for $219.99 if you’re not feeling the extra accessories. and it’s expected to ship summer 2017.